Charged particles in aqueous solutions are always surrounded by a shell of water molecules. However, much is still unknown about the nature of this so-called hydration shell. Using terahertz spectroscopy, chemists from Bochum have gained new insights into how an ion affects the water molecules in its environment. 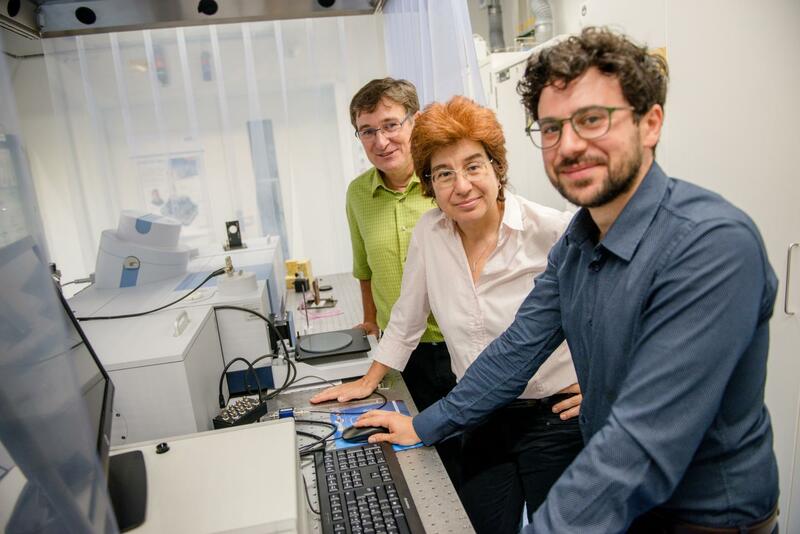 Prof Dr Martina Havenith, Dr Gerhard Schwaab and Dr Federico Sebastiani from the Chair of Physical Chemistry II of Ruhr-Universität Bochum (RUB) provide an overview of the results of the experiments in the journal Angewandte Chemie in July 2018. "The hydration shell of ions is extremely important for understanding fundamental processes such as the transport of ions through membranes or batteries", says Martina Havenith, spokesperson of the Cluster of Excellence Ruhr Explores Solvation. "However, seemingly simple questions, like the size of the hydration shell or the occurrence of ion pair formation, still remain unanswered." At the Ruhr-Universität Bochum, Martina Havenith's team approaches this question with spectroscopic methods developed in-house. The researchers send short pulses of radiation in the terahertz range, i.e. with a wavelength just under one millimetre, through the sample. The mixture absorbs the radiation to different degrees in different frequency ranges, which is made visible in the form of a spectrum. The spectrum, i.e. the absorption pattern, reveals something about the movement of certain bonds in the investigated molecules, for example about hydrogen bonds in a water network. The Bochum group developed special techniques using low-frequency terahertz radiation to determine the size of the hydration shell, i.e. the number of water molecules that are affected by an ion. They mathematically break down the recorded absorption pattern into its components and can thus identify the parts in the spectrum that reveal something about individual ions or pairs of ions. The result: Hydration shells with a size between two and 21 water molecules were determined for more than 37 salts investigated. The number depends for instance on the size of the ion and its valency. Single-charged ions usually affect fewer water molecules than multiple-charged ions. "However, this is not entirely systematic, but also depends on the cation or anion present", explains Martina Havenith. The researchers use their method to determine the so-called effective number of water molecules, which is the minimum number of water molecules that is affected by an ion, i.e. that cannot move as freely as the unaffected surrounding water. Due to the positive or negative charge of an ion, the water molecules with their partially positively charged hydrogen atoms or their partially negatively charged oxygen atom align themselves with the ion. "The effect of the ion on the water molecules gradually decreases with distance", Havenith explains. "Thus there is not always a clear boundary between affected and unaffected water molecules." The team therefore specifies a minimum number for the size of the hydration shell. However, the Bochum group dealt not only with individual ions, but also with pairs of cations and anions. The water molecules affect the formation of the ion pair. They can either form a joint hydration shell around the two partners or separate shells around cation and anion. The team is able to estimate how many water molecules these shells each consist of. "In order to know how many water molecules surround an iron chloride, it is not enough to know how many water molecules are affected by a single chloride ion and how many by a single iron ion", explains Havenith. This is not a simple additive process. "In general, our results clearly show that cooperative effects rather than individual ion properties are decisive", sums up the researcher. It is therefore not enough to know a single ion property in order to predict how a salt will affect the water molecules in its environment. Instead, various parameters, such as the charge density or the combination of the cation-anion will determine whether an ion pair is formed. The experimental data are suitable for theoretical simulations of other groups and can serve as input parameters for chemical process engineering.